The global market for reusable water bottles is displaying steady growth over the recent years as consumers are increasingly shifting towards reusable water bottles in place of single-use bottles. Reusable water bottles that are made of metal, glass, polymer, or silicone offer high durability and strength that single-use water bottles lack. Product manufacturers are striving to introduce novel products that serve consumer preferences and demands. The growing awareness to reduce plastic waste is also acting in favor of the growth of reusable water bottles market. Consumers are increasingly switching to reusable water bottles that do not use plastic and the material used can be completely recycled. However, high portability and easy availability of bottled water makes a solid reason for consumers to refrain from using reusable water bottles. 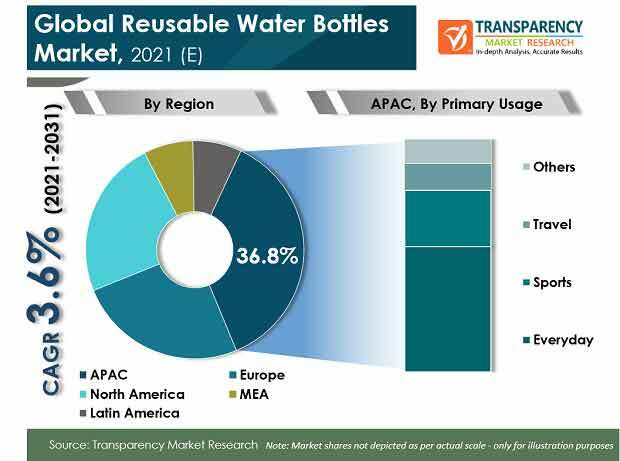 A report by Transparency Market Research (TMR) forecasts the global reusable water bottles market to expand at a CAGR of 3.6% between 2017 and 2025, for the market to become worth US$10.4 bn by the end of 2025 from US$7.6 bn in 2016. Depending upon material type, glass, metal, polymer, and silicone are the key segments into which the global reusable water bottles market is divided in this report. Among them, the metal segment is anticipated to lead holding a little more than 33% of the market over the forecast period. However, the polymer segment is anticipated to emerge lucrative displaying a CAGR of 3.9% between 2017 and 2025 vis-à-vis revenue. The growth of polymer segment is anticipated to relatively cheap cost of polymer-based reusable water bottles. By distribution network, the global reusable water bottles market has been categorized into hyper/supermarket, independent stores, online sales, and others in this market. Among all, the segment of hyper/supermarket is anticipated to hold dominance accounting for a little more than 35% of the overall market during he forecast period 2017 to 2025. The growth of this segment is mainly because of changing lifestyle wherein consumers prefer to purchase household need items under one roof that helps save considerable time. Hyper/supermarkets are also preferred among consumers as they offer promotions and discounts from time to time. On the other hand, independent stores distribution channel is likely to witness a declined market share mainly because of rising popularity of online sales channel. During the forecast period from 2017 to 2025, the market share of online sales channel is likely to grow by 40 basis points. On the basis of primary usage, the key segment include everyday, sports, travel, and others. Of them, everyday segment is anticipated to witness the leading CAGR of 3.8% between 2017 and 2025. At this pace, the everyday segment will account for 52.1% of the overall market by 2025. The growth of this segment is mainly because of increasing adoption of eco-friendly products to reduce plastic waste. Geography-wise, the report classifies the global reusable water bottles market into North America, Europe, Latin America, Asia Pacific, and the Middle East and Africa. Asia Pacific, among all, is anticipated to lead the market in terms of both value and volume. Vis-à-vis volume, the consumption of reusable water bottles is estimated to be 3,902,642 thousand units in 2017, and further rise to 418,208 thousand units at a CAGR of 4.2% therein. North America is anticipated to register a healthy 3.3% CAGR over the forecast period between 2017 and 2025. Tupperware Brands Corporation, CAMELBAK PRODUCTS LLC, Brita GmbH, Nalge Nunc International Corp., S’Well Corporation, Klean Kanteen Inc., SIGG Switzerland AG, Contigo, AQUASANA Inc., Bulletin Bottle, Thermos LLC, O2COOL LLC, Nathan Sports Inc., and Cool Gear International LLC are presently the leading companies operating in the global reusable water bottles market. Transparency Market Research examines the global reusable water bottles market for the forecast period 2017-2025. The primary objective of the report is to identify opportunities in the market and present updates as well as insights pertaining to various segments of the global reusable water bottles market. The report begins with an overview of the global reusable water bottles market, evaluating market performance in terms of revenue, followed by TMR’s analysis of key trends, drivers and restraints witnessed in the global reusable water bottles market. Impact analysis of key growth drivers and restraints based on the weighted average model is also included in the report. To compute the market size, in-depth secondary research is done. Data points such as regional splits and market split by material type, by distribution network, by primary usage, and by region, have been assimilated to arrive at the market estimates. The report comprises the forecast of the global revenue generated by sales of reusable water bottles market. TMR triangulates the data via different analysis based on supply side, demand side, as well as dynamics of reusable water bottles market. In order to understand and assess opportunities in this market, the report is categorically divided into seven key sections on the basis of material type, distribution network, primary usage, and region. The report analyses the global reusable water bottles market in terms of value (US$ Mn) and volume (‘000 Units). Vital feature of this report is the analysis of the global reusable water bottles market by material type, by distribution network, by primary usage, and by region; and the corresponding revenue forecast in terms of absolute dollar opportunity. This is traditionally overlooked while forecasting the market. However, absolute dollar opportunity is critical in assessing the level of opportunity that a provider can look to achieve as well as to provide potential resources from sales perspective of the global reusable water bottles market. To understand key segments in terms of their growth and performance in the reusable water bottles market, Transparency Market Research has developed a market attractive index. The resulting index should help providers identify existing market opportunities in the global reusable water bottles market. Key players in the global reusable water bottles market include Camelbak Products, LLC., BRITA GmbH, Klean Kanteen, Inc., Tupperware Brands Corporation, SIGG Switzerland AG, Contigo (Newell Brands), AQUASANA, INC., Bulletin Bottle, Thermos L.L.C., Nalge Nunc International Corp, S’Well Corporation, O2COOL, LLC, Nathan Sports, Inc., and Cool Gear, International LLC.